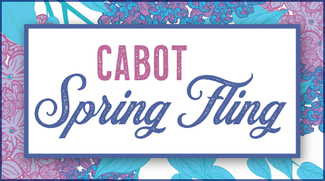 The Cabot Spring Fling is coming up on Saturday, April 6th and we need your help to make this event a success! Volunteers are needed the evening of Friday, April 5th as well as during the day and evening on Saturday. Please sign up below to help with event preparations. Thank you in advance and don't forget to buy your tickets at www.cabotpto.org! 1. Items should be individual and easy to pick up (cookie, brownie, cannoli, etc). We don’t plan to use utensils. 3. Bring on a disposable plate OR tape your name to the bottom of the plate if you want it returned. 4. Include a card with the basic ingredients listed. If it is purchased, leave the label attached. Help set up tables and decorations. Hi! I can help Friday but can’t get there until 7pm. Hope this will help. Looking forward to it! I probably won't be there until 7! Break down tables and clean up. Help with plating and arranging food. Monitor food and keep area tidy. Check in attendees and sell tickets at door. Monitor auction tables and keep area tidy. Collect all bid sheets and organize for check out. Accept payments and distribute items.